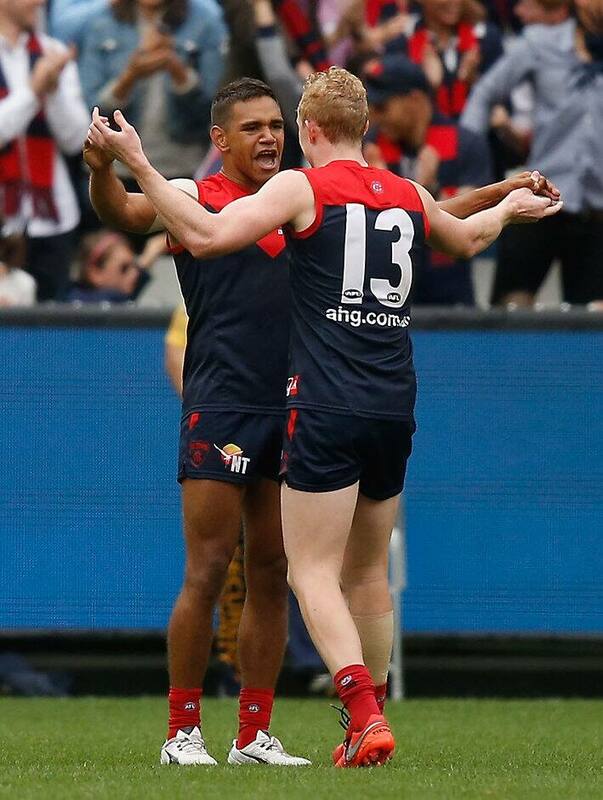 THE COACHING moves that sparked Melbourne to a stirring comeback win over Greater Western Sydney simply couldn't have been considered when Paul Roos took over as Demons coach two years ago. Now the Demons have the depth and talent to change tack quickly and – when moves come off, as many did in the two-point win over the Giants – change the course of the game in their favour. Roos said the side that he coached for the first time in round one, 2014 would have been unlikely to pull off a comeback from 21 points down at the final change. It's a different story now. At three-quarter time Nathan Jones swapped roles with Bernie Vince, with the skipper pushing back to half-back and Vince spending time in the middle for the first time for the game. Speedster Jeff Garlett went to the wing and Jesse Hogan, who began the quarter goalless, pushed deep into the forward line after finding both the football and confidence with a short stint in the midfield at the end of the third quarter. "Those things we could not have done two years ago," Roos said. "It was impossible. It was Nathan (Jones) and Bernie (Vince) and then Dom (Tyson) and Jack (Viney), but now there is a lot more to work with [so] we can move some players around." Within five minutes Melbourne had kicked three goals from three inside 50s – two to Hogan and one to Watts – and the first two goals had started with centre clearances from first-gamer Clayton Oliver. The margin was reduced to three points and the game was alive. "We are a lot more interchangeable now," Roos said. "When you put our team up on the board now it is less predictable... it just allows us to do some different things." For instance, Roos was able to put Oliver into the middle as soon as he came onto the field early in the first quarter, and he could leave Watts as the third tall inside 50, letting him roam wide where he caused some damage. "[Watts] was probably our most dangerous forward all day and looked like he was going to impact on the scoreboard and create something for us," Roos said. The much-maligned Demon had five touches in the last quarter for four score involvements and a goal. He also kept hope alive earlier in the game when Hogan struggled to overcome the Giants' defensive focus on him. Tom Bugg and Ben Kennedy were impressive in their first games for the club, while Max Gawn broke even in the ruck. It was a gritty win – Melbourne's third come-from-behind victory in three NAB Challenge matches and one home-and-away game – but not one that masked the ongoing need for improvement. "We've improved a lot but we still have a fair way to go if we want to be consistently playing good footy for four quarters," Roos said. "But [there are] a lot more positives than negatives."